TACLOBAN CITY- There were singing and dancing punctuated with laughters and wild cheers from the villagers of Barangay 66-A in Anibong district, this city, as the members of the Alpha Phi Omega United International Organization, Inc. Visayas Council-Tacloban chapter, conducted their regular community service project in the said coastal village on November 10. Incidentally, the activity took place just two days after the country marked the fifth year anniversary of super typhoon ‘Yolanda’ that barreled its way in the region, particularly Tacloban City, considered as the ground zero of the world’s strongest typhoon to hit inland on November 8, 2013. Delia Bato, the village chair, said that they are just grateful that the organization chose their village of more than 1,500 residents of their community service project. “This is a depressed area with most of the residents are considered as indigents. We are really thankful to them for coming here and giving us some joy. We felt privilege for this,” Bato said. Boots Palconite-Buena, who spearheaded the group’s activity, said that they have been visiting various villages in the city to conduct their outreach program as part of their corporate social responsibility. Barangays located along the coast were the most affected areas when Tacloban was pummeled by the super typhoon as they were directly hit by the storm surge spawned by Yolanda. ‘We’ve been doing this activity for years now in coastal areas in the city from San Jose to (Sagkahan) astrodome,” she said. “This is part of our corporate social responsibility because one of our missions is to serve God, country, people, and nature,” Palconite-Buena added. The members of the organization pooled their resources together to finance their community programs to the villages. Palconite-Buena, a member of the Board of Trustees for Visayas Council, Tacloban chapter, said that their activity was held coinciding with the anniversary of Yolanda’s onslaught. Aside from providing slippers, as part of Palconite-Buena’s ‘Sapin Sa Paa’ project, residents of Brgy. 66-A, who attended the activity were provided with a hot arroz caldo, a popular congee with chicken, rice, and an egg. 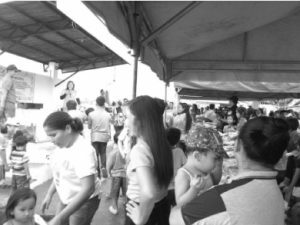 About 400 people of Brgy.66-A benefited from the goodwill of the Alpha Phi Omega United International Organization, Inc.
“We chose Brg.66-A because this is one of the badly-hit barangays during Yolanda’s onslaught. We go to communities that needs our help and services,” Palconite-Buena said. The holding of their activity in Brgy. 66-A was held simultaneously in Barangay Talibaew of Calasiao, Pangasinan Council, spearheaded by Tony Macanlalay.